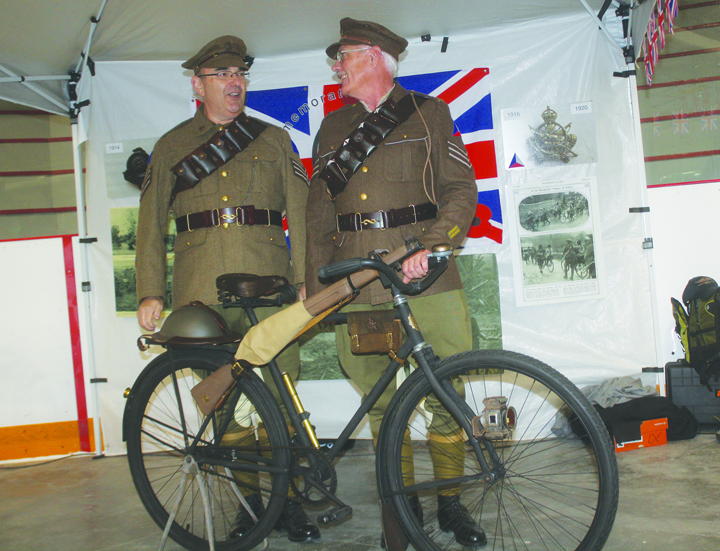 Martin Schultz (left) and Brad Christensen of Saskatoon dressed as Canadian soldiers for their exhibit detailing the exploits of and equipment used by the Canadian Cyclist Corps in the First World War at the Dusty Wheels Auto Show in Rosetown in September. A little-known Canadian squad finally did the jobs they’d volunteered for, four years earlier, when they led the Canadian Corps surge during the final 100 days of the First World War. Two retired RCMP officers who displayed artifacts of the Canadian Cyclist Corps in Rosetown this fall thought that authorities would give that 1,200-man unit special recognition as part of Remembrance Day ceremonies this year. Remembrance Day falls on the centennial of the armistice ending the First World War – Nov. 11, 1918 – the reason the November date is designated as Remembrance Day. Brad Christensen understood that the National Defence Department would honour the corps as part of the armistice centennial celebration.